A fuel surge tank (FST) is designed to prevent fuel starvation to the engine on vehicles with inadequate fuel tank baffling. The FST fuel pump feeds the fuel rail(s). The volume of fuel inside the surge tank acts as a buffer to always keep the FST pump supplied with fuel. This volume is maintained by the main fuel tank’s (lift) pump as well as the fuel returning from the fuel pressure regulator. In the case of the FST-R (patent pending), the regulator is built in to the surge tank and is recirculating fuel internally. Excess fuel in the surge tank is returned back to the vehicle’s main fuel tank. 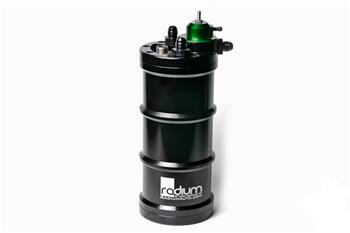 The FST-R (Fuel Surge Tank–Regulated) is an all new design that houses a single internal fuel pump and has an integrated fuel pressure regulator machined into the top cap. The high-flow regulator is adjustable and features interchangeable orifice sizes. This revolutionary idea eliminates the need for an external fuel pressure regulator along with the extra fittings and hoses. This simplifies the installation, reduces overall cost, reduces weight, and eliminates potential leak points in the fuel system. Furthermore, this system permits cooler fuel temperatures as the fuel is not returning from the hot engine bay. Like all Radium fuel surge tanks, this universal product can be used on any fuel injected application and is compatible with all fuel types. The FST-R can be configured with fuel pumps from many leading manufacturers, including Walbro, AEM, Aeromotive, and Deatschwerks. Note: The FST-R is not available in dual-pump configurations. 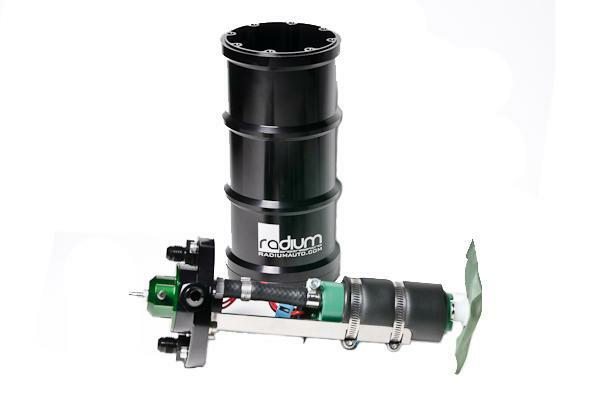 If the pump is purchased as part of the FST-R, the surge tank will come fully assembled and will be pressure tested for leaks and ready to be installed. If the pump is purchased elsewhere, some assembly will be required.